Featuring amenities like free Wi-Fi and lots of in-room appliances the Americas Best Value Inn combines affordable lodging with easy access to I-10 and downtown Mobile attractions. The two-story budget motel has 86 rooms featuring free Wi-Fi cable TV microwaves mini-fridges and eco-friendly bathroom amenities. The on-site tour desk offers tickets to local tours and attractions. 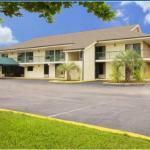 Fax machines photocopying facilities an on-site laundry room and free parking are among the other amenities offered. Small pets are allowed for a fee. The hotel is located off I-10 in Tillmans Corner a suburban neighborhood 15 minutes south of downtown Mobile attractions such as the USS Alabama and the Mobile Convention Center. Popular spots closer to the hotel include the Cloverleaf Plaza Shopping Center which is less than a mile away and Schwarz Park which is five miles away. The University of South Alabama is a 20-minute drive from the property. Mobile Regional Airport is 11 miles away.